Big Ant Car Seat Gap Filler, 2PCS Car Pocket - Only $13.99 + FREE Shipping w/Prime! Check out this Big Ant Car Seat Gap Filler, 2PCS Car Pocket on Amazon for Only $13.99 + FREE Shipping w/Prime! Have you ever get your important items out of hand when you were driving? Have you ever dropped your parking card, coins, smartphones, keys, bank cards etc. between your seat and console? Big Ant car seat gap filler will end this. It makes everything important within your arms reach and keep them organized beside car seat. 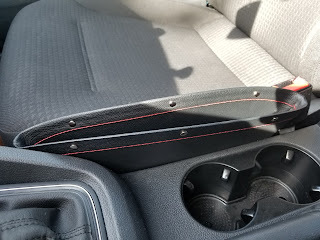 PREMIUM MATERIAL- Big Ant car seat gap filler is made of high quality PU leather,which has a good grip to stay in place and durable, anti-scratch, precise stitching. Also, it is made with special rivets giving it a unique design. SUITABLE SIZE- The car pocket organizer size is L:11.4 * W:2 * H:3.9 inch. with gap size between 0.75 - 1.5 inches. Please check car seat gap dimension to make sure there is still space for things to fit in. MULTIPURPOSE FOR STROAGE- The car pocket organizer is perfect for storage some small item such as mobile phone, wallet, Key, parking card, sunglasses, pens, data cable, CD etc. 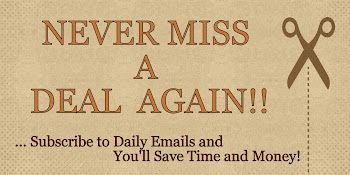 It makes keeping up with things you need easier. 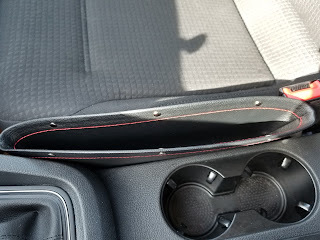 PREVENT DROPPING ITEM- The purpose of creating this accessory was to eliminate the hassle of spending so much time while trying to find lost items in the cracks between the car seats. And we achieved it. Its special design and ideal width, covers perfectly the crack and doesn't allow for cash and phones to fall in the gap. EASY TO USE- Simply slide between front bucket seats and the middle control until you find a nice snug spot. 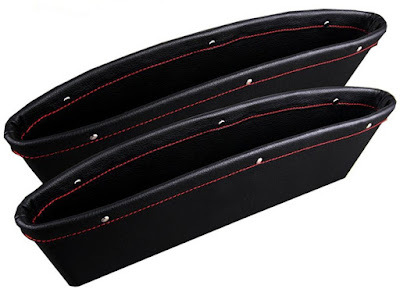 This set comes with 2 pcs of Seat Console Gap Filler (1 for the driver side and 1 for the passenger side). A great accessories for your car.